Stewart Iron Works has been designing unique iron fencing and gates since the 1860’s. Each gate we’ve installed over the last century have managed to grace the finest homes, institutions, historic sites and parks across the country; making a statement in and of themselves. Our gates not only provide a welcoming first impression, they consistently deliver value and style to any home or business within the complete overall design. At Stewart, our iron work is known for its beauty, functionality and ability to last for generations. The fence we designed and installed for the Taft Museum, located in Cincinnati, OH, continues to stand today; showcasing the landmarks timeless beauty, as well as, showcasing Stewart’s own artistic talent. Our skilled designers, engineers and craftsmen, not only create today’s custom masterpieces, but are renowned for their ability to tackle almost any restoration project. In recent years we’ve restored the Taft Museum several times, and rebuilt the main entry gates when the museum expanded its driveway to accommodate semi-trucks for museum acquisitions. “The Taft never looked better or more glamorous,” said Taft Director, Phillip C. Long, “I loved the old Taft, but now we are up to date in every way, a state-of-the-art facility. We can better handle the growing needs of our constituents through better temporary exhibitions, public programs and special events,” (Cincinnati Enquirer, 2004). 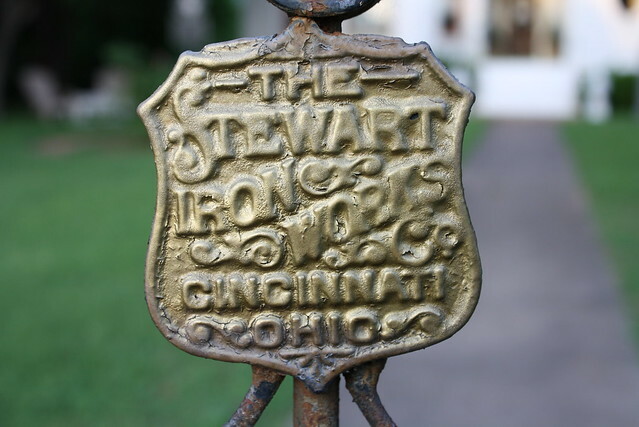 We at Stewart Iron Works are honored and proud to know the ‘Stewart Shield’ protects this historical landmark, because today the Taft Museum is ranked one of the most popular tourist attractions in Cincinnati and one of the most luxurious art museums in America! ← Alcatraz. One of Stewart’s Greatest Endeavors.